We live in a very modern society, so modern in fact that our shoes actually change the physical form of our feet over time into weaker and less practical feet. Our ancient ancestors were familiar with nature, the environment, the elements and walking barefoot. Walking barefoot was and still is one of the most primal instincts for mankind. Simply walking on the earth, whatever element that may be is part of human nature. We’ve evolved into weak feet that could once climb rocks, rubble, dirt, sticks, thorns and more into having the nice cushion at our soles. We’ve lost our natural way and we don’t even realize how it effects us. It’s easy to forget what’s natural and most beneficial for our body in exchange for the convenience and comforts of modern day living, but are we losing something of value in the process of doing that? I think we are. By walking barefoot we experience multiple benefits that we don’t receive either at all or nearly as much by walking with shoes. One of the more obvious benefits of walking barefoot is that we have a connection to the earth and it’s magnetic field. 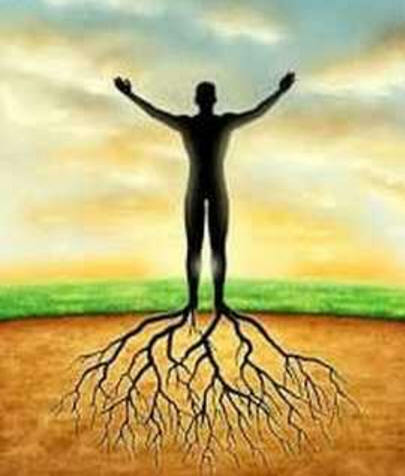 Our body is conductive to the earth and the earth is conductive to our body. 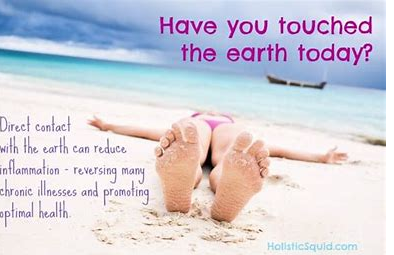 The earth is full of negative ions and we flood our body with negative ions by walking barefoot, this is also known as ‘earthing’ or grounding. A great book to read to learn more about this is the book Earthing by: Clinton Ober. We need negative ions, especially in today’s world. Positive ions are more abundant in cities and anywhere near electronics and electro-magnetic frequencies. Think your cell phone, laptop, tablet, television, cell phone towers, microwave etc. Basically anything with a power source that emits a signal, bluetooth, wifi, even electronics that don’t emit a signal still emit positive ions. 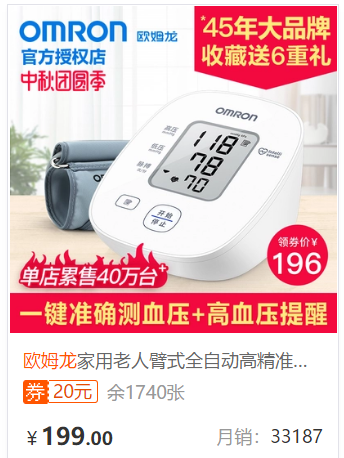 Because we live in a world of positive ions and disconnect ourselves from the earth’s natural negative ion field we are flooding our body with pro-inflammatory positive ions caused by the electronics and gadgets around us. Our ancestors slept on the earth itself or close to the earth. 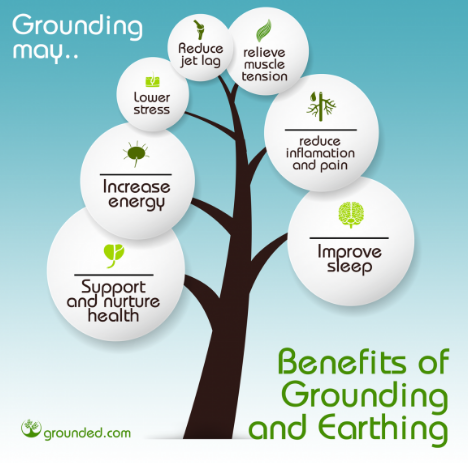 By being grounded (otherwise known as earthing) it relieves tension and removes positive ions to make way for negative ions. Negative ions are relaxing and help you to improve sleep quality. Ever go swimming in the lake or ocean and slept great that night? or went swimming in the lake or ocean and walked barefoot on the sand that day? You were earthing in the water and on the sand and you slept better because of the negative ions flowing through your body. I also personally believe that walking barefoot helps to balance your circadian rhythm to give you better awake/asleep conscious awareness. The best rested people on the planet wake up with the sun and go to bed when the sun sets. I think walking barefoot is a subconscious reminder of that ‘natural’ time to wake and sleep. Our bodies are around 70% water and the more grounded we are in nature the more conductive and alive that water is in our entire body. Walking barefoot helps to create an ionic balance within our cells and tissue. Exercises with the most age and wisdom such as martial arts, yoga and tai chi are all done barefoot, do you wonder why? This helps us wire our brain to be on our feet at all times. When we walk with shoes we don’t “think on our feet” as much because we are somewhat disconnected from our feet. 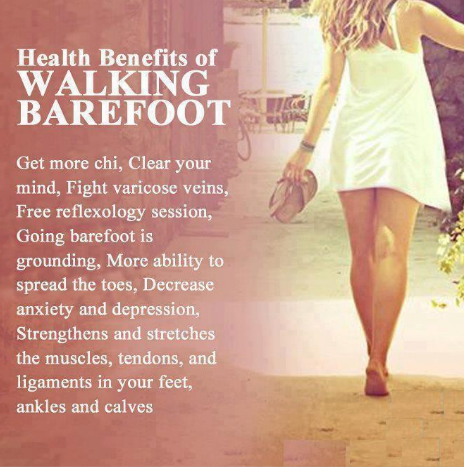 Walking barefoot helps to balance emotional and mental stability and well-being. Our cavemen ancestors walked on sand, grass, wood and pebbles. Because we wear shoes all the time we miss out on the sensory experiences involved in that process. Our feet when stimulated transmit that information to other ares of the body. There are multiple pressure points and nerve endings on the bottom of our feet that go unstimulated because of shoes. When we remove shoes we open up our sensory would and allow our nervous system to explore more. When you walk barefoot you have to be more alert, aware and present in this moment because you have to watch where you’re walking. It takes walking subconsciously and makes it conscious again which makes you conscious and present which is a valuable gift. Walking barefoot also stimulates the nerves and pressure points on the bottom of the foot which can help to bring chi energy (life force, prana, different cultures have different names for this) to different areas in the body associated with those pressure points on the bottom of your foot. Our foot muscles are weaker than ever because of shoes and soft surfaces that don’t cause our feet to be flexible and strong like they once were. This leads to bad posture because we become reliant upon other muscles to do the job our feet are responsible for doing. Our weak feet can lead to bad posture which can lead to back pain, neck pain, even knee pain which is actually often caused from shoes that misplace your postural alignment. When we begin to walk barefoot, run, jog and play with just our feet we can begin to strengthen our ankles, feet and toes again which give us better balance, stability and posture. Learn more about the posture of your toes and how shoes have weakened and ruined your feet over the years and how to fix that by reading this article.